Even a turkey can get a reprieve: Microsoft's CodePlex shut-down date has run late, but is still imminent. In March, Redmond announced it would put its collaborative software repository out of its misery. Its intent was to put the site into read-only mode during October, ahead of a December 15 shut-down. 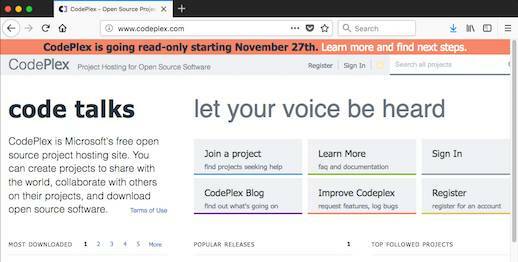 That timetable seems to have slipped a little: visitors to CodePlex are warned that read-only state will be implemented next Monday (November 27), although the original announcement warned the doom-day would be on November 6th. Migrating to GitHub is a pressing issue, though, because after read-only date, developers will no longer be able to apply the "redirect" tag to their archives. While the read-only schedule has slipped, there's no reason to expect the final shutdown, slated for December 15, will be delayed. When the CodePlex servers are shut down, Microsoft will still provide an archive so that projects' histories are not erased.